Blu-ray is finally playing catch-up to streaming video with the launch of the first 4K Ultra HD Blu-ray players. Samsung will be the first to bring a 4K Blu-ray player to market with its UBD-K8500, priced at $400. (Pricey as that may seem, Samsung’s first Blu-ray player cost $1000 when it launched a decade ago.) The company originally said it would ship the new players in March, but Engadget reports that Best Buy is now bumping up the ship date to February 10 for pre-orders. 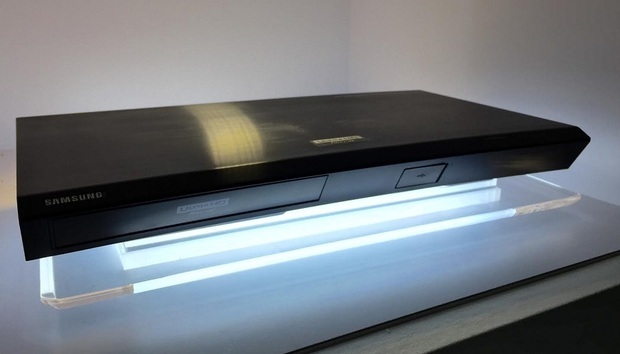 Meanwhile, Los Angeles-based Video and Audio Center has begun selling Samsung’s 4K Ultra HD Blu-ray player already, with demonstrations in its showroom. Fry’s is reportedly selling some units in stores as well, according to users at AVSForum, and its website lists a February 22 ship date for online orders. Compared to HD Blu-ray discs, which plays content in 1920-by-1080 resolution, the new Ultra HD format supports a much higher resolution of 3840-by-2160. Just as importantly, the new Blu-ray spec has built-in support for HDR video, allowing for higher brightness and more vibrant colors when played on HDR-capable TV sets. Of course, to enjoy these benefits you’ll also need new Ultra HD Blu-ray discs, which aren’t widely available yet. And as if the player itself wasn’t expensive enough, movie studios are looking to charge twice as much for the new format. The Martian on Blu-ray, for instance, will cost $30 in 4K Ultra HD, compared to $15 for the HD version. On the bright side, Amazon is now streaming a range of Ultra HD and HDR content for free with a Prime subscription, and Netflix charges just $2 per month more for Ultra HD streaming with access on up to four devices at a time. Why this matters: With the rise of streaming video and all the convenience it brings, Ultra HD Blu-ray is unlikely to break out of niche status. Still, it’s going to be the video format of choice for videophiles who don’t want to deal with the potential buffering or compression artifacts that come with streaming, or who simply don’t have the bandwidth to stream in 4K. Just keep in mind that prices are likely to come down as more hardware options arrive, and it’s probably worth waiting for more HDR TVs and Blu-ray discs to arrive with them.